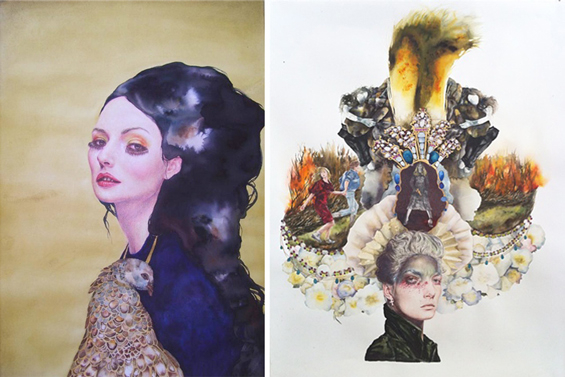 "Serena Cole blends watercolors, colored pencil, and other materials in her stirring portraits, deftly adding provocative elements in the contours of her subjects. 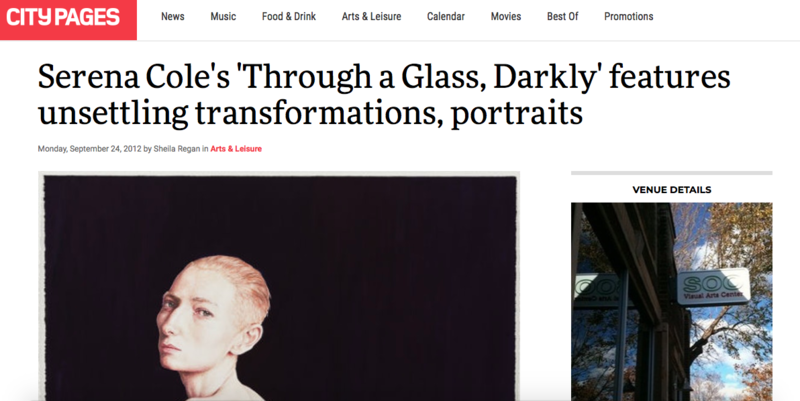 In recent works, the artist “considers each piece an avatar of herself,” a recent statement says, with self-portraits that reflect on different experiences of being a woman today." "GS: What about live models or people within your circle? SC: I guess I’m just not interested in ‘real’ stuff. I like the power of finding something that already exists; the photo exists but the person in the picture doesn’t really exist in the context in which they are presented. It’s an image that has gone through photoshop, make-up and direction to create a fictional identity, which I often juxtapose with other images to create new narratives. The only time I’ve ever wanted to take my own photos was of some of the high school students I teach. There’s something about being a teenager - I really identify with the angst and the horrible, awkward beauty of being a teenager. I want to go there, I just haven’t made any of those drawings yet." 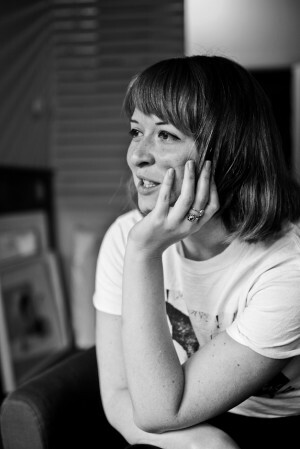 ' “As a girl or woman, it feels like a time to be angry, to be sad, to be unsatisfied and to be loudly opposed to people in power who seek to further diminish the rights of women,” says Cole, who teaches art at Maybeck High School in Berkeley. 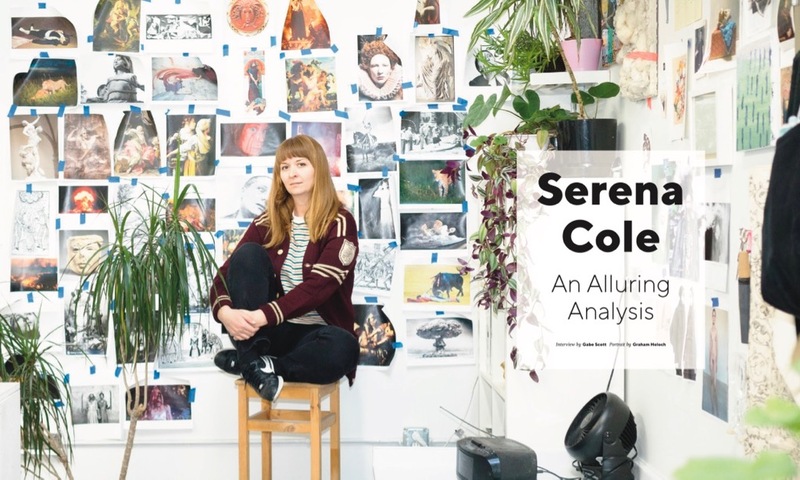 "I recently caught up with artist Serena Cole at her light-filled, image-plastered studio in West Oakland. 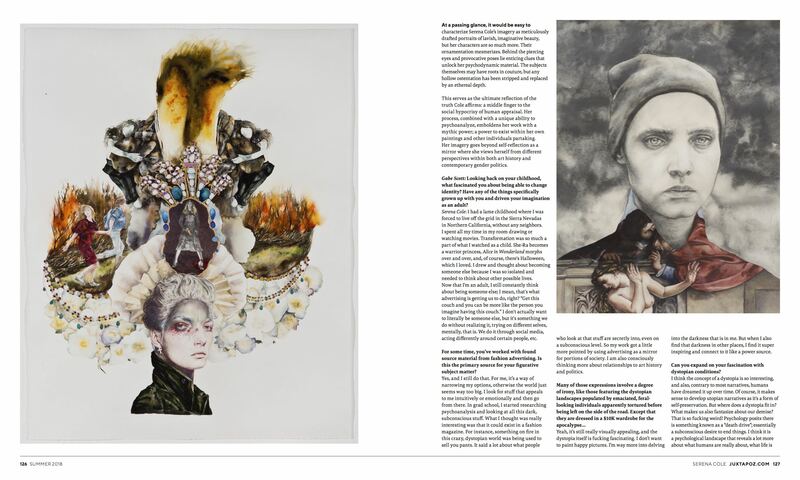 A lengthy and generous conversation, we discussed everything from her recent solo exhibition of dazzlingly complex figurative works on paper, to the shifts in her pictorial content following that showing, as well as her evolving relationship with the magazine format – and much more." 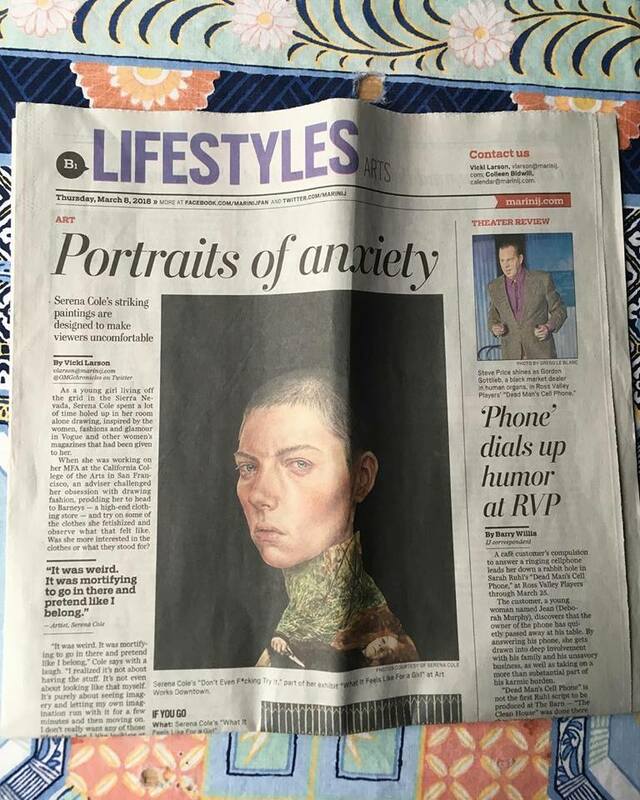 OPP: "Why do all these women seem so sad? 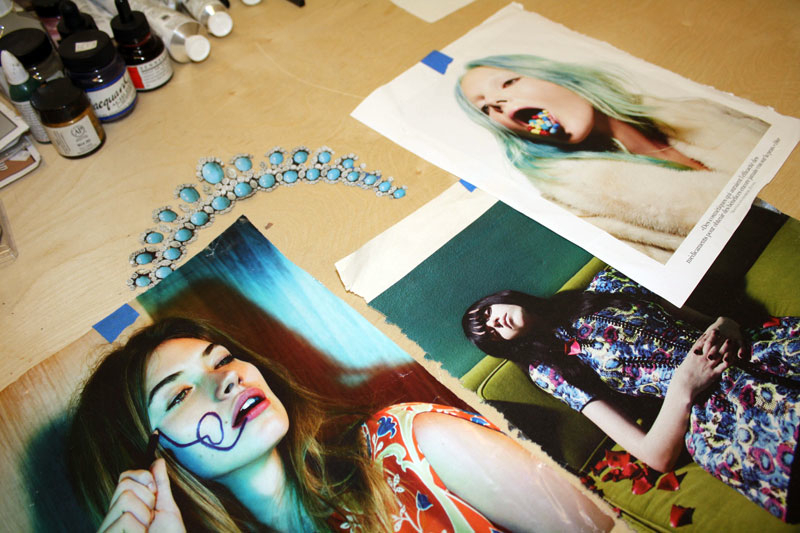 Do you consciously avoid the fashion campaigns that employ images of joie de vivre?" SC: "I have no interest in happy paintings in the same way I can't listen to the Cure past 1989 because they suddenly cheered up. I am interested in telling a subtle story with the expressions in my work, and there is no story in happy. It's boring to me because I am still an angsty teenager stuck in my room." "The second I saw the work of Serena Cole, I realized that it had been a long time since I had seen something so beautiful. There is something very profound about her work. I love how detailed her portraits are. 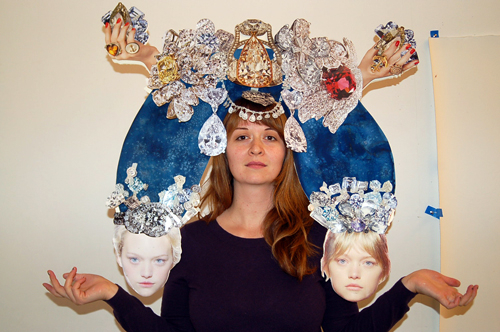 The mix of materials she uses makes her images extremely powerful." "Cole’s paintings, she says, aren’t as much about beauty as about society’s love of beauty." "It's a deeply unnerving set of work. Cole has a talent for blending an uncanny realism with a simmering anger that forces you to interact with the work". "In being so tightly tethered to the aesthetics of the fashion world, Serena’s work runs the risk of coming off as analogous instead of questioning. Serena is aware of this risk— in creating art within a framework already heavily loaded with well-established associations, value, and perimeters, she knows the trick is to get the viewer to recognize that there is actually a lot at stake amidst the glitz and glamour". 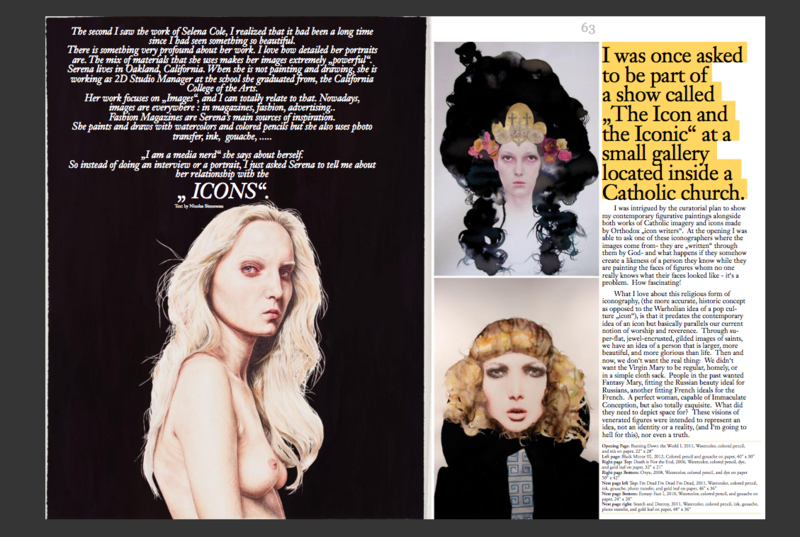 "The walls of Serena Cole's CCA studio are populated by faces from fashion magazines. 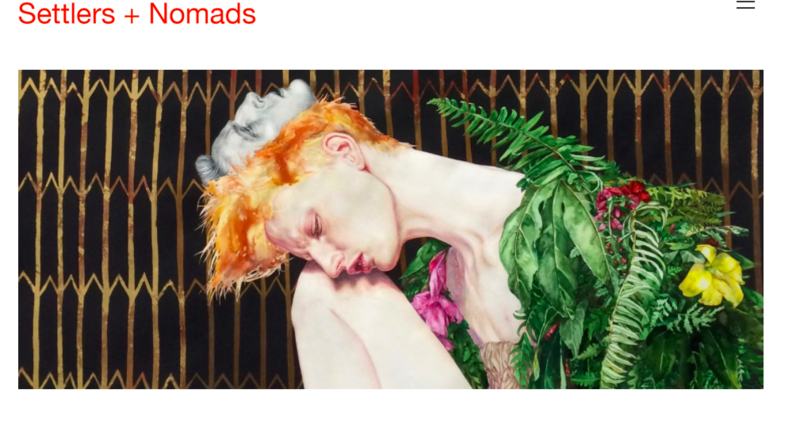 The models' ferocious beauty is re-imagined with watercolor, and a certain murky darkness in their expressions and angular poses is revealed. We recently stopped by Cole's studio and got to chatting about the evolution of beauty, her historical inspirations, and her almost Pretty Women-esque high-end shopping spree." 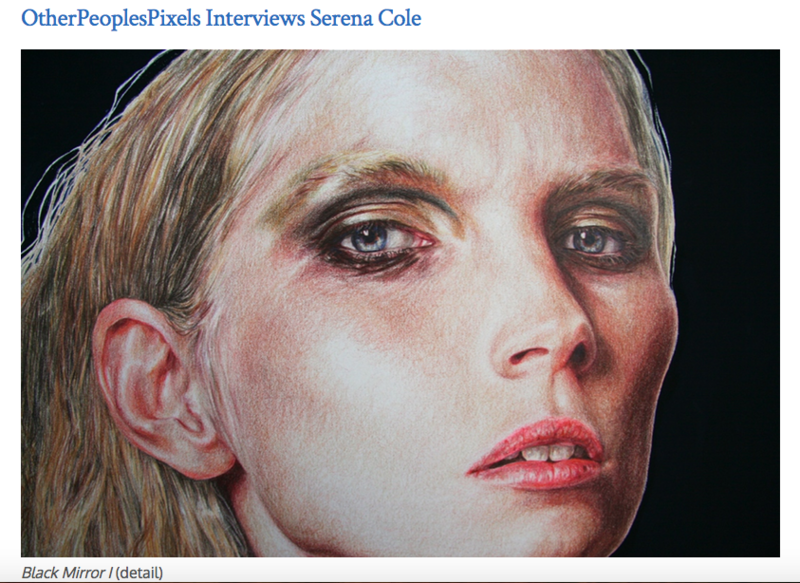 "Serena Cole‘s work bridges fashion and traditional portraiture. Showing a mastery of her medium, Serena transforms watercolor and gouache into pieces that feel effortless. 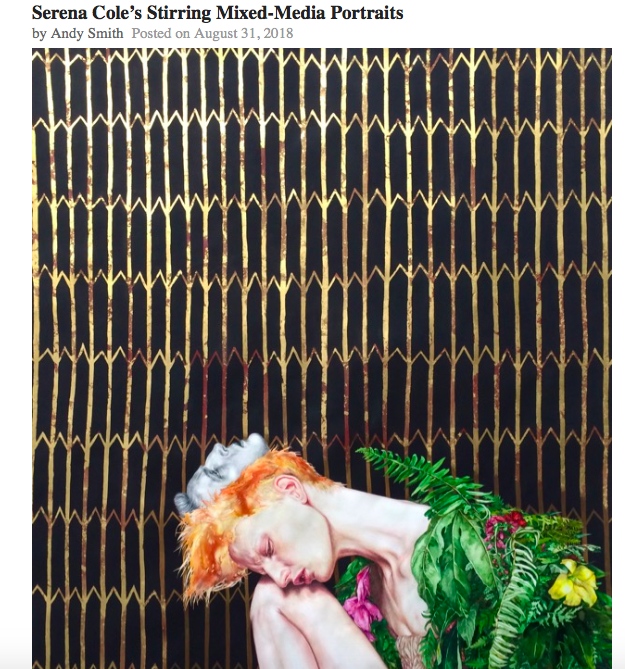 Some of her earlier works incorporate gold leaf as well, which feel reminiscent of medieval altar paintings where the face and gesture are key. Her take on fashion portraiture is full of emotion, often unseen in the stoic nature of fashion photography. Being such a busy time with her graduation from CCA, she was sweet enough to answer a few questions about her work and life." 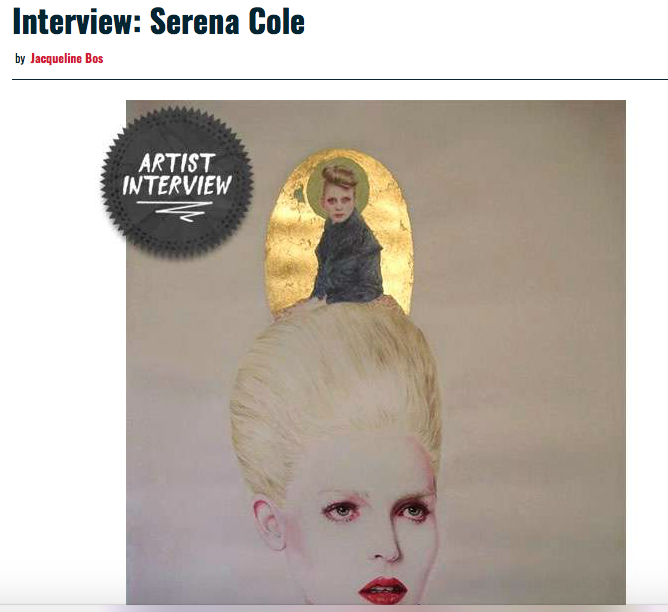 "A few months ago I met up with Serena Cole on the last night of CCA's MFA show to see the culmination Serena's work for the year. We also stopped byt her studio before she moved out. I've always been drawn to Serena's combination of fashion, style and her own personal twist within her paintings. 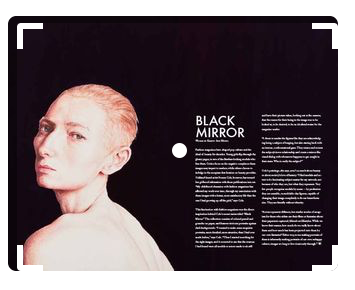 There always seems to be a somewhat darker vibe below the surface of her work -- calling out the darker side of fashion. 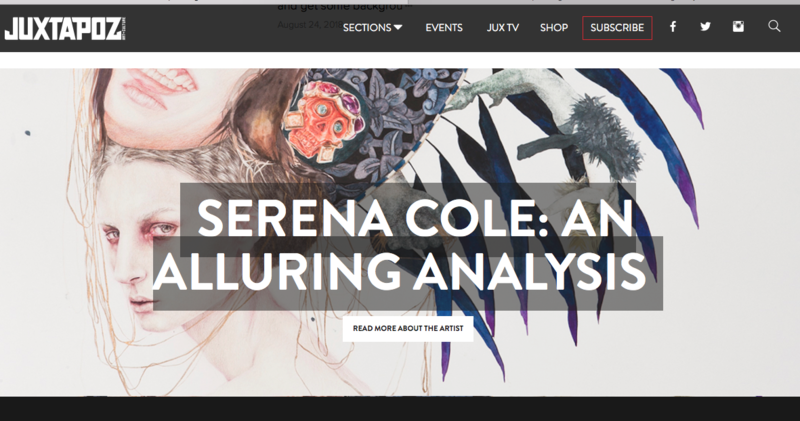 Along with images from the show and studio -- Serena and I chat about her take on fashion and her interpretation of it through her own work."